One of the greatest pleasures in our work at Tabitha is the privilege of visiting and seeing the new schools being completed. 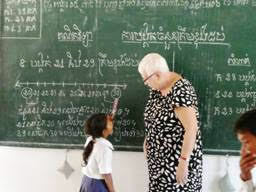 For many children a new school – a chance at education signifies a new life; a new beginning. 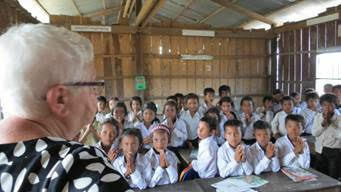 Over the past few years, Tabitha Cambodia has built 89 schools through the generosity of some of our donors. For the children that attend the schools, it is excitement beyond words. How do I explain meeting 14 year old Phat sitting amongst a class of two year olds – so grown up yet willing to be with those much younger than him – a desire to learn – to understand the mysteries of reading and writing – mysteries that will open a whole new world for him. How do I explain the pride 10 year old Sarouen showed as she read the lessons on the board or 13 year old Ches as she read from the textbook? How do I explain the joy of students being in a proper classroom – sheltered from wind, rain and heat rather than sitting under a tree learning lessons? How do I show what it is like not to sit in a room that is collapsing around the students – sitting in dust up to their ankles? How do I explain the excitement that fills the children as they arrive for school everyday? How do I explain the marvel of the little ones as they begin to learn the secrets of the world around them? We are so very grateful for the generosity of all of you who stand with us – yet we are also confronted with the needs and desires of so many of these young people – a chance at a new life – a chance to decipher a written page; a chance to discover the mystery of maths and sciences; a chance to learn of other countries, different ways of thinking; of reading books that tell of history. I thank my God for this gift of new beginnings, the gift of hope. 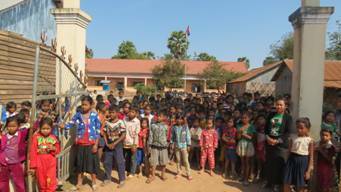 I thank my God for each of you who bring these new beginnings to so many in Cambodia. May the hope and joy of new beginnings bring each of you the blessings you have given to so many here. How good that is!